Yesterday, the New York Times published an article by Sam Dillon, discussing huge increases in the number of children nationwide who are receiving free or reduce-price school lunches since many of their parents have recently lost their jobs or homes. According to the article, the number of students receiving subsidized lunches was at 18 million in the 2006-2007 school year and peaked at 21 million last year. Fiscal year 2010 saw 1.3 million additional children eligible for free lunches, the largest increase in program participation since 1972. The Joint Select Committee on Deficit Reduction, also known as the Super Committee in Congress, failed to address the necessary amount of cuts to reduce the federal deficit, triggering automatic $1.3 trillion cuts set to begin in 2013. Many of the disagreements came over reticence on tax increases and cuts to social safety net programs like Medicare, Medicaid and Social Security. Half the cuts to come will be from defense programs, while certain federal programs – including Medicaid, Social Security and SNAP (Food stamps) – will initially be insulated from such cuts. However, other domestic spending programs may be in danger of losing funding. (News has come out this weekend suggesting that the Super Committee may have hit an impasse. However, until such news is definite, we must continue to reach out to them in support of programs that families rely on to stay secure throughout the year. The Super Committee is coming close to their deadline. Many proposals are being floated, including one that would limit states’ ability to coordinate the Low-Income Home Energy Assistance Program (LIHEAP) and SNAP benefits (food stamps). This “Heat and Eat” program allows many states, including Pennsylvania, to coordinate SNAP and LIHEAP in recognition of the fact that too many struggling Americans face an impossible choice between paying for food or paying for energy. On Friday, PathWays PA presented information on our Self-Sufficiency Standard before the Bucks County Women’s Advocacy Coalition. This Coalition works to serve women and girls and is focused on achieving economic self-sufficiency for all through advocacy work in areas of child care, health care, housing, transportation, job and workforce development; domestic violence and addiction issues affect all areas of concern. What Do You Know About IDAs? IDAs, or Individual Development Accounts, are great ways for families to be rewarded for saving money. Through the United Way, PathWays PA offers these IDA accounts so that students can get their savings matched to pay for college. At the same time, students take financial literacy classes to help learn to budget their money and continue saving for the future. Want to learn more? Listen to this great interview that ran on Power 99 this weekend! Please read this article on NBC10's website and share it with your friends! November is National Runaway Prevention Month and fittingly, a new shelter has opened in Philadelphia to help get young girls off the streets. The Basic Center Program or “Girl’s SHElter” is for girls under the age of eighteen who are homeless, runaways or at risk of becoming either. "This program gives girls a chance at a good life when almost everyone else has walked away from them," said Lenora Pope, Program Manager at the Girls' SHElter. To read the full article, visit http://www.nbcphiladelphia.com/news/local/Girls-SHElter--opens-in-Philadelphia-133889398.html. The Pennsylvania Health Access Network has hosted hundreds of educational forums on the new health care law. This special one will be focused on the coming exchanges and will also touch on Medicaid integration and other public health programs. Philadelphia, PA – As we approach Thanksgiving, there is a new reason to give thanks: a new shelter for runaway girls in Philadelphia. This program, called the Basic Center Program or “Girls SHElter,” offers runaway prevention and intervention to girls under age 18 who have run away, are homeless, or are at risk of running away or becoming homeless. PathWays PA Online Auction and Fund the Mission Continues! Did you miss the PathWays PA Gala on November 1? Well, we still have some great items available for you to bid on. With the great packages available we are sure they will go fast so bid today. In addition to purchasing a trip, dinner, or experience you will also be helping to further PathWays PA’s mission of helping over 6,000 low-income women, children and families move from poverty to self-sufficiency and family well-being! the name of the package you are bidding on, your opening bid, your final offer and your phone number.Bidding for online auction items will close on Wednesday, November 30, 2011 at noon. 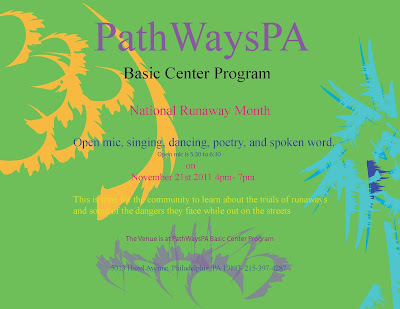 Join PathWays PA on to learn about the trials of runaways and some of the dangers they face while out on the streets. Open mic, singing, dancing, poetry, and spoken word will be from 5:30-6:30. PathWays PA has recently updated our popular Financial Resource Guide. This Guide lists programs that individuals and families can use to help stretch their incomes and make ends meet. Glenolden, PA: PathWays PA was among the charities receiving grants from the Wal-Mart, Glenolden store for their grand reopening. Director of Development Fran Franchi of PathWays PA was there to accept the check for $1,175.00 from Store Manager Edwin Martinez. 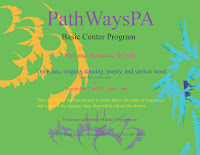 PathWays PA was established 33 years ago to help women, children and families become economically independent and self sufficient, and has an office in Holmes, PA, not far from Glenolden. However, PathWays PA serves not just Delaware County, but the entire Greater Philadelphia region. PathWays PA’s services to over 6,000 women, children and families include the residential Center for Families, which fosters a safe, healthy and economically stable future for women and children. In Holmes, PathWays PA offers adult education and family literacy classes to help assist adults and families in furthering their education. Join us on November 21st 2011 4pm- 7pm to learn about the trials of runaways and some of the dangers they face while out on the streets. Today at 2:00 the Federal Communications Commission and Federal Emergency Management Agency will conduct the first nationwide test of the Emergency Alert System. This test is key to ensuring the nation is prepared in the event of a natural or other disaster. It is a way the public can receive critical and vital information if it is ever needed. The test may last up to three and a half minutes and will be transmitted on radio and television stations through out the country. For more information about the nationwide Emergency Alert System test, please visit www.FEMA.gov and www.FCC.gov. Right now in Congress members of a Super Committee are working to reduce the federal deficit by $1.2 trillion. Pennsylvania Senator Pat Toomey is one of the lawmakers on this Super Committee. Help urge Senator Toomey to stand up for Pennsylvanians byjoining the Keep Pennsylvanians Covered quilting campaign. Before the November 23 deadline, the group will present Senator Toomey with a quilt crafted by volunteers. Share your message to be featured on a patch! Email Athena to have your health care message included. Also be sure to check out the Virtual Quilt. Hover your cursor over or click on one of the panels in the quilt to the right to read a message in support of preserving health care for Pennsylvania families. Last month, the National Human Trafficking Resource Center Hotline Act (SB 338) was unanimously voted out of the Senate Labor & Industry Committee. This state legislation would require posting of the National Human Trafficking Hotline - 1-888-3737-888 - so trafficking victims can call to get help or individuals can call if they see anything suspicious. This November marks the 10th anniversary of National Runaway Prevention Month. This month is designed to raise awareness about the serious problems that runaway youth must handle, and to display how important is is to prevent runaways. The Family and Youth Services Bureau, the National Runaway Switchboard, and the National Clearinghouse on Families and Youth have joined together to organize a series of events to educate and increase awareness of runaway youths. Throughout the month, they encourage people to take to social media outlets such as Facebook and Twitter to start a discussion on the problems facing runaway youths. The NRS website offers tips on how to get started. Finally, they encourage workplaces to set up a "Green Sock Day" during November, and send pictures of all of their employees wearing bright green socks to the NRS, to raise awareness. When: Friday, November 18, 2011 9:30 a.m. - 11:00 a.m. Birth certificates are often needed to receive medical assistance, housing and other public benefits, to obtain a Pennsylvania driver’s or nondriver’s license, for access to many public buildings, for general identification and for many other purposes. 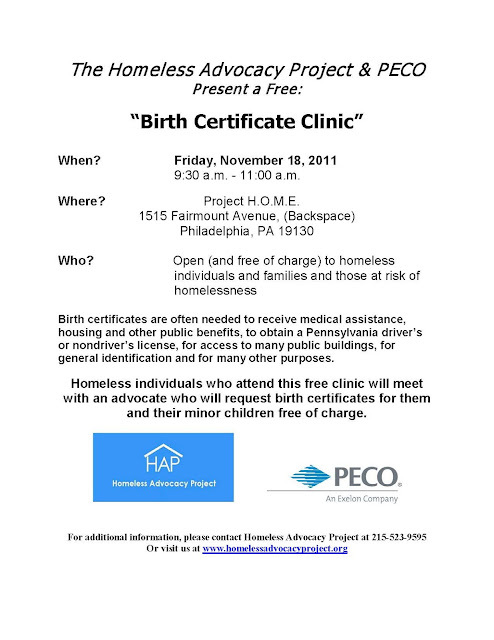 Homeless individuals who attend this free clinic will meet with an advocate who will request birth certificates for them and their minor children free of charge. 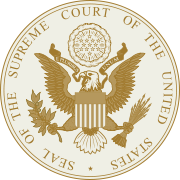 Last week, the Senate sent two major pieces of legislation to Gov. Tom Corbett’s desk, aimed at boosting safety for Pennsylvanians on the road and for students on the playing field. Lawmakers gave final approval to a measure that prohibits motorists from sending, receiving or reading text messages while driving. That measure passed the Senate on Tuesday with a 45-5 vote, one day after the House also overwhelmingly approved it. Mr. Corbett has spoken harshly about seeing drivers navigating their vehicle while their eyes are glued to a cell phone screen, and plans to sign the bill. Click here to read the Pittsburgh Post Gazette article. On November 1st, PathWays PA celebrated its 33rd Anniversary, by hosting an evening “PathWays to the Stars” and honoring Trailblazers in the community whose lives and leadership make an impact in our community. In commemorating over three decades of helping low-income women, children and families in the Greater Philadelphia region achieve self-sufficiency, PathWays PA honored six local community leaders and organizations with the 2011 Trailblazer Award. Honorees receiving the Trailblazer Award included: The Delaware County Daily Times; Kyra McGrath, Executive Vice President and Chief Operating Officer, WHYY; Juliet Welker, President, Coldwell Banker Welker Real Estate; Laney Vogt, Adopt-a-Family Advocate; QVC; and Yvonne Norris, President and Co-Founder of LimNorris Consulting Group. These individuals and companies have been chosen for their contributions to helping those in need as well as improving the quality of life in the community. From the Delco Times "Heron's Nest"- "A honor from an honorable group: Pathways PA"
I had the good fortune to represent the Daily Times last night as the newspaper was honored by Pathways PA with one of their Trailblazer Awards. It was us, and in fact all of Delaware County, who should be honoring them. For 33 years, Pathways, based in the Holmes section of Ridley Township, has offered crucial services to needy women, children and families. They provide the glue that very often holds shattered families together. 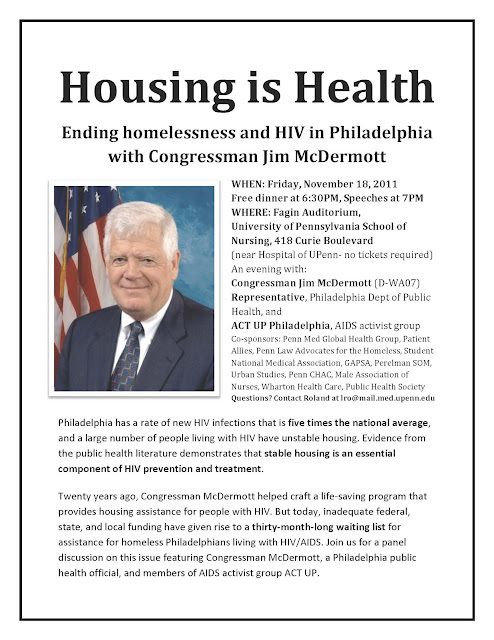 To read more, please visit http://delcoheronsnest.blogspot.com/2011/11/honor-from-honorable-group-pathways-pa.html.